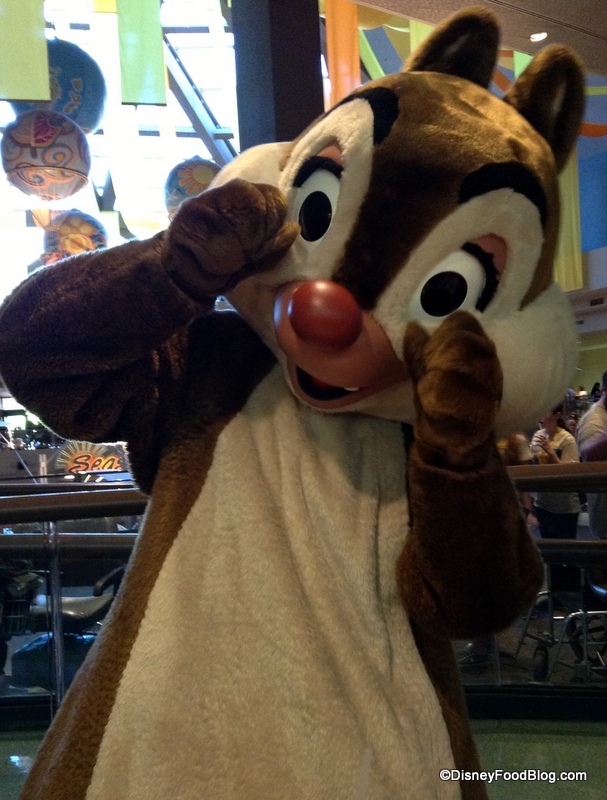 You’ll also meet Chip and Dale. You can tell them apart by their noses. This one’s Chip (because his nose looks like a chocolate chip)! As per usual, the ‘munks can get a little silly here! And Dale has that adorable red nose! 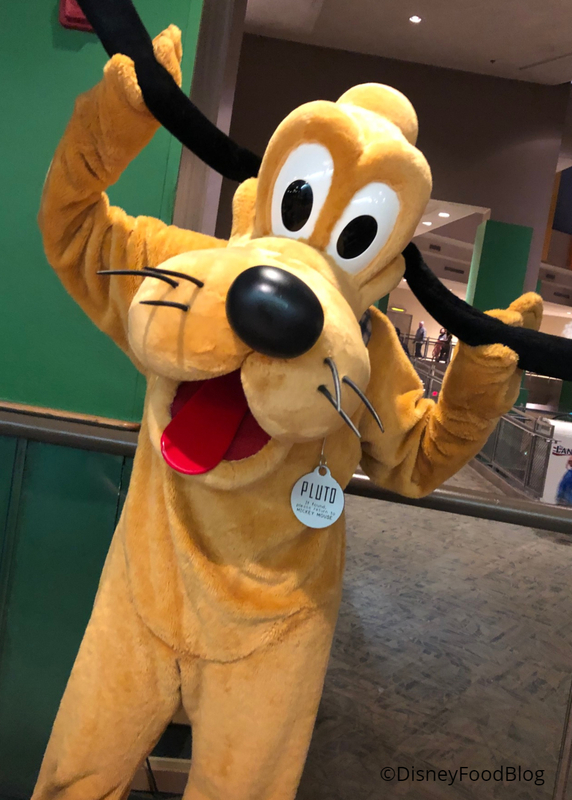 If you’re more of a dog person, Pluto keeps things fun with his signature pose! Garden Grill is also fun in that characters often rotate through more than once, meaning you might catch a certain pup’s signature pose… more than once! 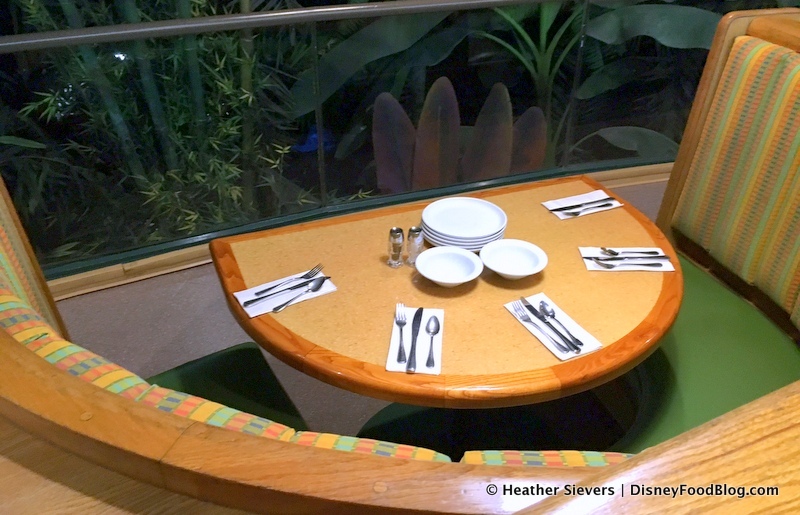 For Disney Parks fans, Garden Grill has the added perk of giving diners a bird’s eye view of Living with the Land! The restaurant is designed to have an upper level and a lower level, and that lower level is best for catching these views. 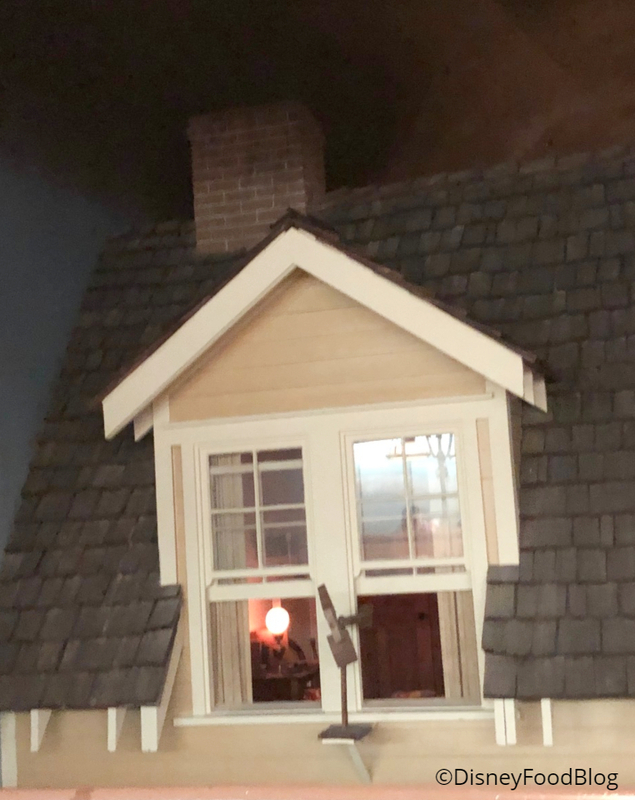 Many of us daydream about living in this quaint farmhouse. Living with the Land Farmhouse! And good news! 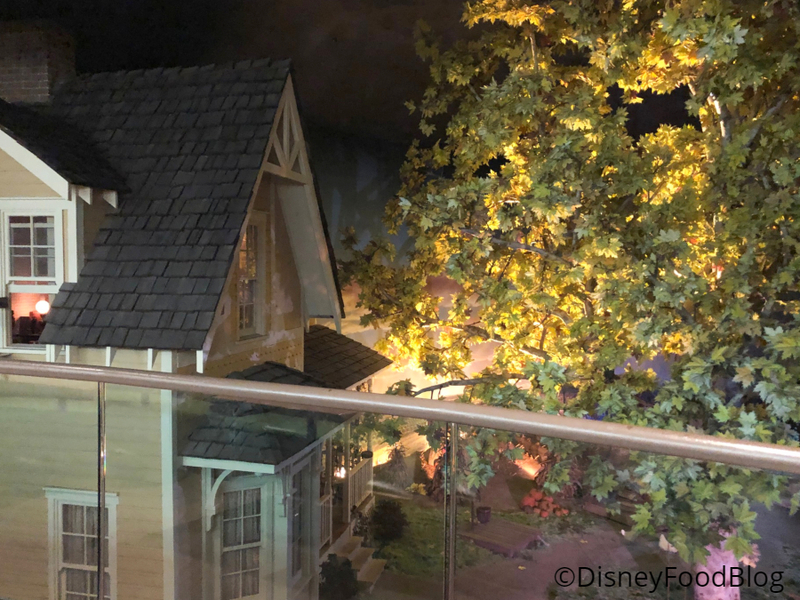 When you dine at Garden Grill, you can see that they’ve left the light on for you in your farmhouse! 😉 All. about. those. details. But okay, characters and theme park attractions are fun and all, but what about the food? Garden Grill dinner is typically pretty good! Our last review was from just over a year ago, and things have been tweaked — but in a good way! 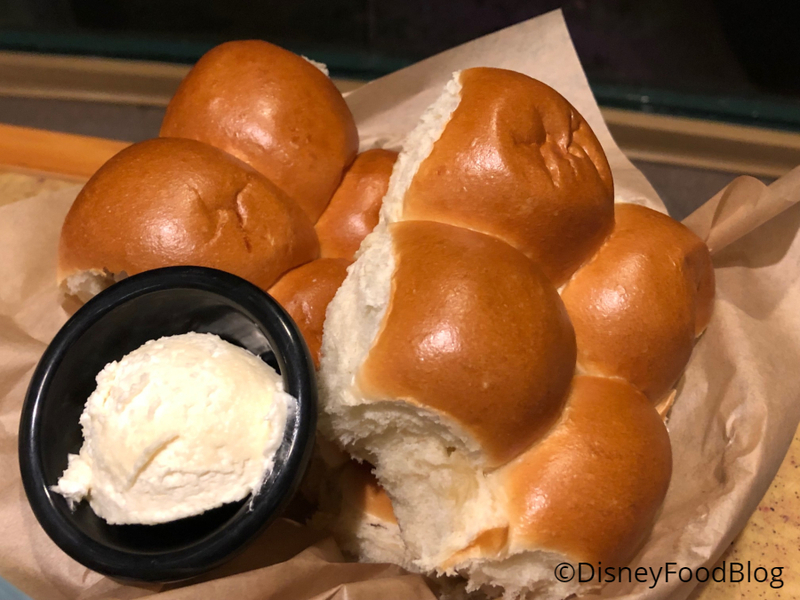 The meal at Garden Grill starts with some warm, tasty dinner Rolls and Butter. These are a great way to begin this foray into comfort food. Next up, as always, is the Harvest-Inspired Salad. This is renowned as consisting of vegetables grown right downstairs in the Land Pavilion. This time it included black olives, cucumbers, and mixed greens. It’s dressed in a tangy vinaigrette. Since our last visit, the platter of meats has become a skillet. This presentation is somehow more appealing, with vibrant colors dispersed throughout. I think it actually LOOKS like more food, too — even though this has always been an all-you-care-to-eat restaurant. The items on the skillet have also improved. 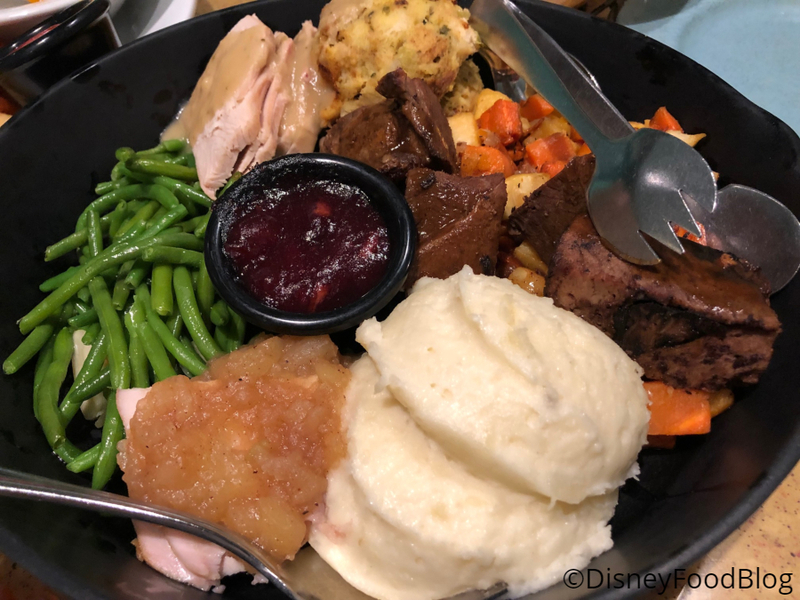 The Sliced Turkey was delicious and moist, as was the Slow-Braised Pot Roast (a superior version of the pot roast of past visits in that it now comes with braised potatoes and carrots just like Mom used to make!!). I had mixed feelings to see that Carved Pork with Apple Chutney had replaced Italian Sausage. I thought the sausage was delicious, and while the pork is fine…I’d probably prefer the sausage. Sides on the skillet include buttery Green Beans, tart Cranberry Sauce, seriously delicious Herb and Leek Stuffing, and some honestly great Buttermilk Mashed Potatoes. In addition to alllllll of this, we also received a platter of carbs: Mac and Cheese (with Goldfish — the only place we’ve spotted the famous crackers in the World! ), French Fries, and Sweet Potato Fries! 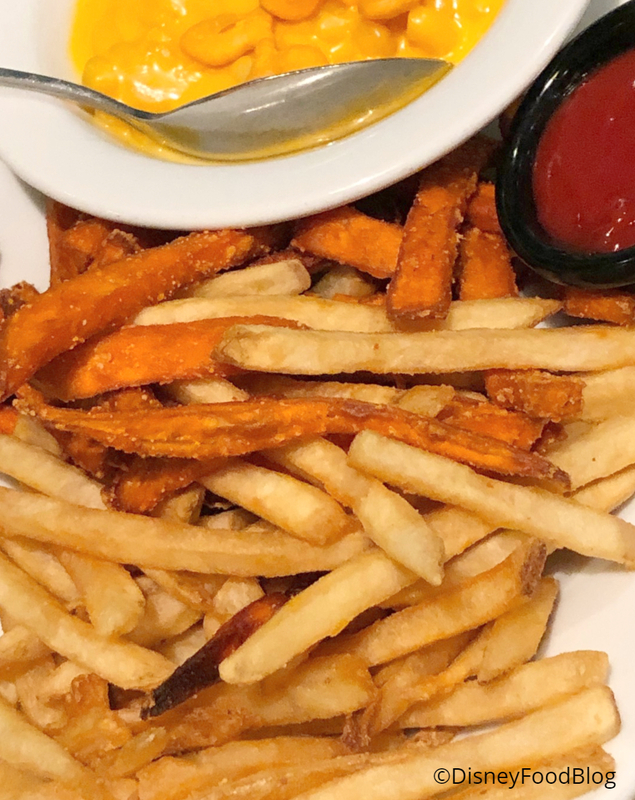 That last bit — the Sweet Potato Fries — momentarily replaced the traditional French Fries for a short while last year, to the chagrin of many guests. But now (at least on my visit!) there was a little bit of both! The Mac and Cheese is super creamy and satisfying, and if you’ve got a picky eater in tow, this will do! Dessert hasn’t changed here in a while, and that’s fine with me! 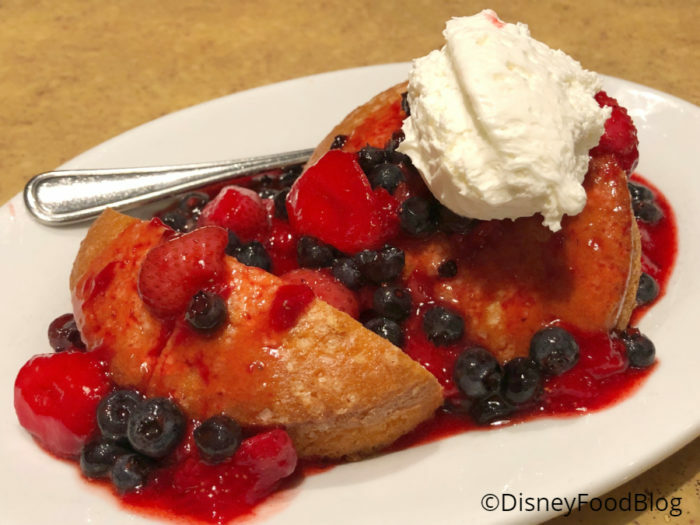 Berry Short Cake is a combo of strawberries and blueberries in strawberry sauce (all fresh tasting) ladled atop a split round pound cake. Vanilla Bean Whipped Cream finishes it off. 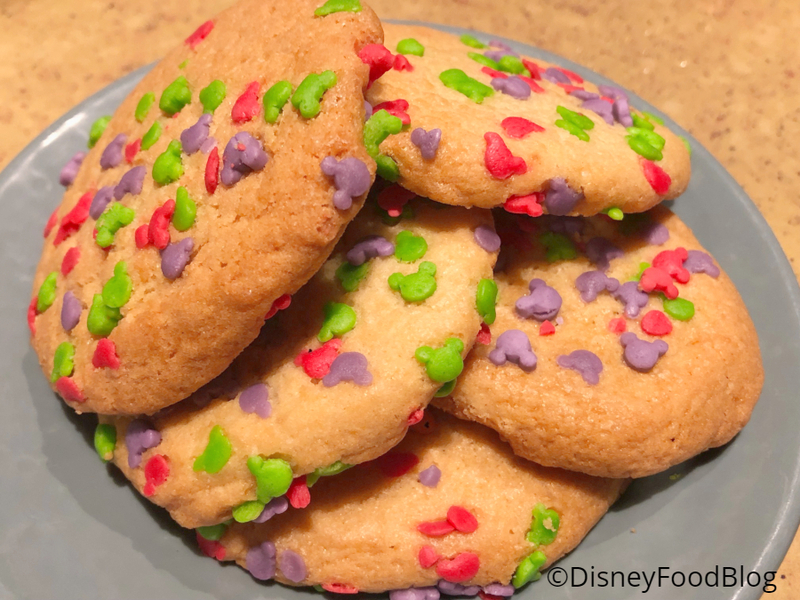 If you need them, these classic sugar cookies are also available! I think this was the kids’ dessert on our visit. Sadly, it’s not anything as cute and unique as it used to be for the kiddos. 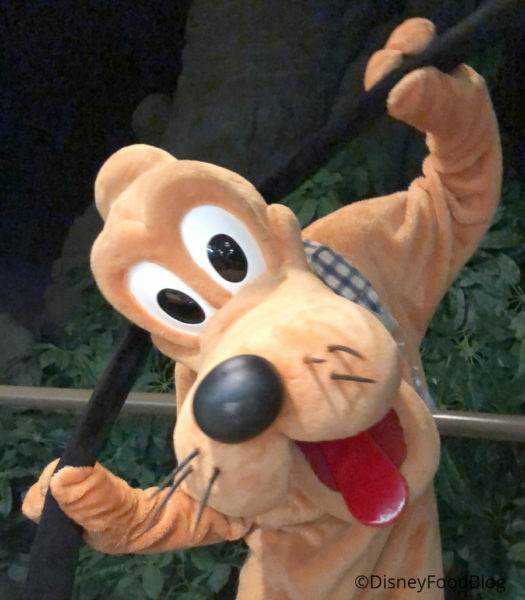 Garden Grill is still a super fun character meal in a unique location that also happens to have delicious, comforting food. 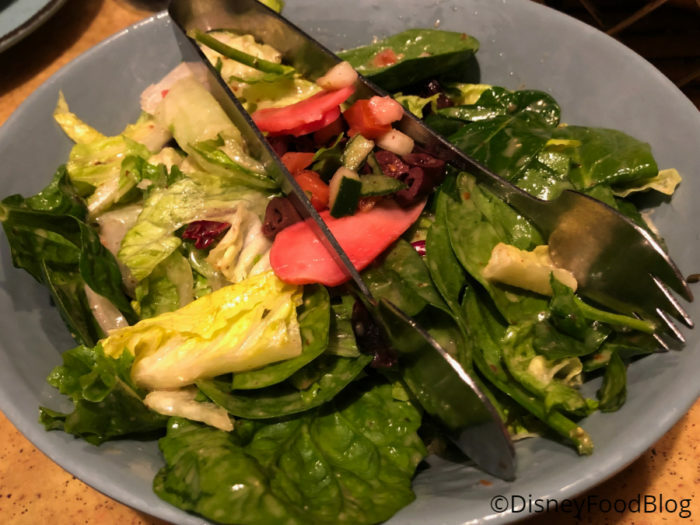 And because it’s a bit more under the radar than Chef Mickey’s or Cinderella’s Royal Table, getting an ADR at Garden Grill tends to be a little easier. But that doesn’t make it any less exciting! 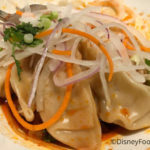 It’s easily one of my favorite character meals in Disney World! 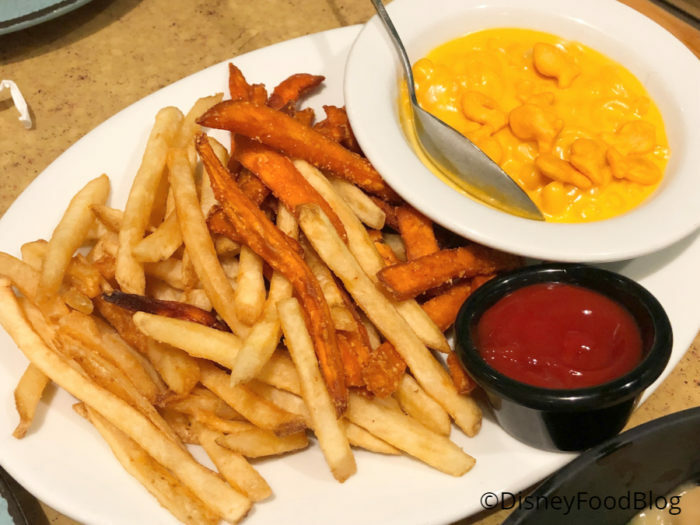 Curious about which character meal is right for you? Click here to see our tips! 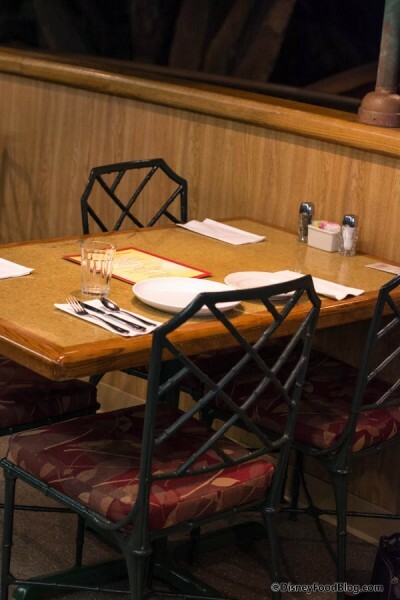 Have you dined at Garden Grill? Tell us about your experience in the comments below! 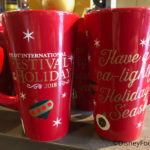 « Reusable Bags in Disney World and Disneyland Debut With Exclusive, Location-Specific Designs! Wow, you must have read my mind! I was just trying to decide if we were going to keep our dinner reservation at Garden Grill. We’ve never been before and I’ve always wanted to try it (we usually ride Living with the Land multiple times and have been intrigued by the restaurant floating above the farmhouse). I just wasn’t sure it was worth the time for comfort food but you’ve convinced me (Pluto helped, too). Thanks! I agree a out the Crystal Palace, except for Breakfast. It’s hard to mess up breakfast and getting an early reservation to walk down Main Street before the park opens is AWESOME! It’s also less crowded and easier to see the characters in the large restaurant. Lunch and Dinner are really busy and I agree the food isn’t stellar. We loved this place! My kids loved the food and so did my Mom. Plus we loved the booth seating arrangement. Loved seeing the characters in their farm outfits. I hate to say it but I sadly disagree with this review. 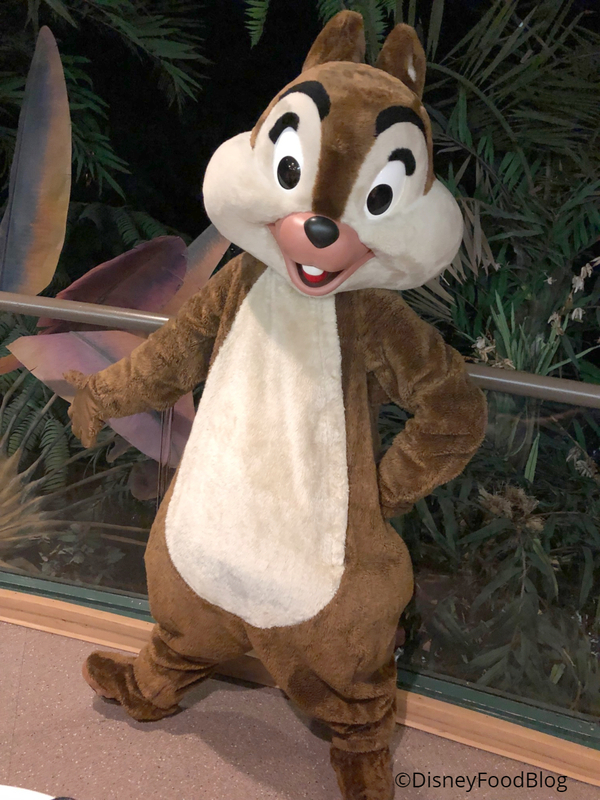 The character selection is just ok. Chip and Dale are great fun but my children were less interested in them compared to many of the more famous characters. The view of Living with the Land was alright but I expected to be able to see a lot more than I could. Just ride the attraction instead as you can’t see that much from Garden Grill. The food. What can I say. It’s basic cafeteria food. I’m not sure who wants to go to Disney and eat green beans, mashed potatoes, and stove top stuffing. The meats are just alright and the fries were soggy. Just not great food at all. I know everyone complains about the food at Chef Mickey but it is honestly 100 times better than what I got at the Garden Grill. I have never been to O’hana for breakfast character meal but on last trip went for dinner as we always do and found it to be absolutely awful, sad to say. Food was scarce meat was dry. Maybe it was just an off night as we have always enjoyed it in the past. 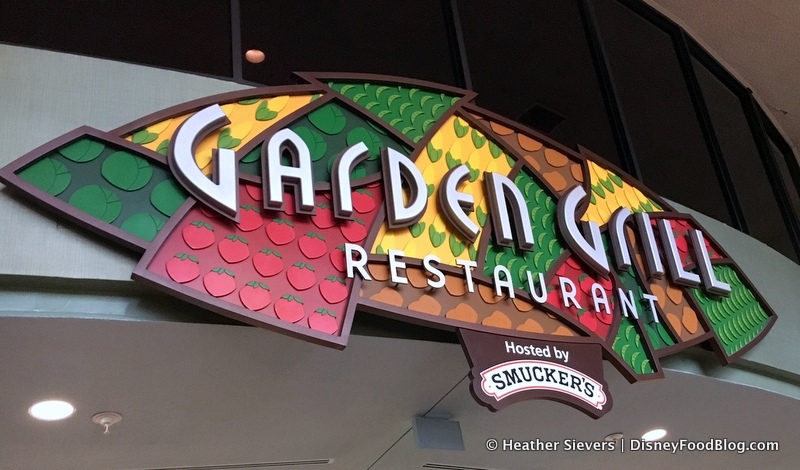 Haven’t gone to Garden Grill in years, I will agree that there is a lot of character interaction, but never found food to be very good. If time permits we always try to do Crystal Palace, it is large and chaotic, but very pretty, and I find the food to be above the O’hana and Garden Grill in variety and quality. 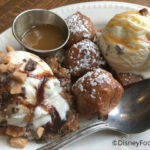 I hadn’t been to 1900 Park Fare in years, but did their breakfast onour last trip and found it to be so good that I decided to give the dinner another try. I couldn’t believe how much it had improved since i had been there last. It was so good that I decided to go back a second time on the trip bringing my family, which are decidedly “foodie snobs” and they loved it as well. Also love the character meal in Norway, setting is beautiful characters fun and food varied and delicious. Cape May another favorite. We ate at Garden Grill during our visit in September for breakfast. We loved it! The food was so delicious and the juice was amazing. Definitely my in park choice for breakfast and a character meet! Used to love Garden Grill and go before any RunDianey race but their vegetarian entree was changed out and it was terrible! Haven’t been back since. 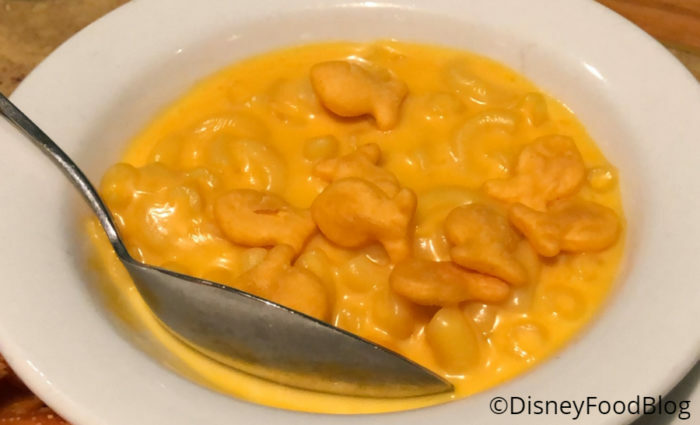 This meal looks very similar to Liberty Tree Tavern, would you say it’s comparable in taste and quality? My family and I love the food at Liberty Tree and this would give us another option to get the same meal if they’re similar. I agree with Jeremiah’s posted review. The green beans they keep throwing at you in every single dining location because its a cheap ingredient and costs them nothing, yet its terrible. 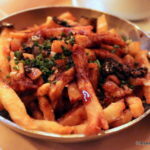 The fries look pathetic I cant believe they cant do better than that. Aside from those our meal here on the plus side has always been pretty good, and if you want more of something instead of something else they will do that. But Disney needs to quit already with the hard cold green beans in every restaurant. Its even worse at liberty tree, they refuse to substitute anything. I LOVE Garden Grill. I went last year (July 2018) for dinner by myself. Since my ADR was at 4:55pm, there was next to nobody in the restaurant. The character interactions were awesome. 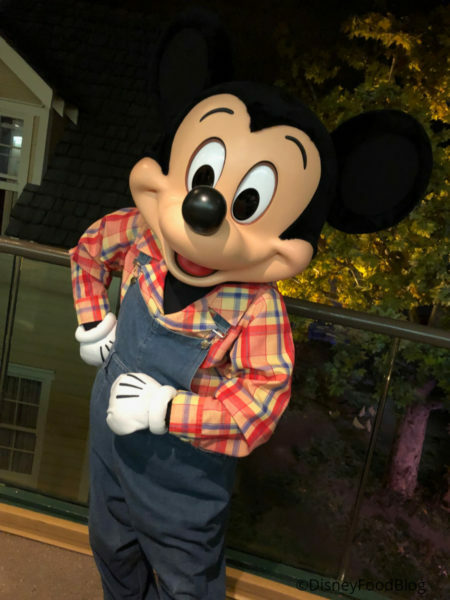 Mickey even sat down at my table with me for a little bit, and one of the CM got fabulous pictures of us sitting across the table from each other and holding hands. He(the CM) took tons of pictures for me with all the characters using my cell. I’m glad to see they are back to “Real Turkey” and not cold cut slices. The pot roast and dressing (in the south that’s stuffing) were amazing. And I’m not usually a salad person, but having lettuce and other vegetables being fresh from downstairs makes a huge difference. I do wish they offered different options for dessert though. 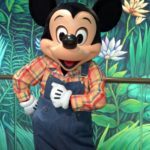 When I was a reservations CM with Disney, I often told parents of special needs kids to make reservations at Garden Grill rather than Chef Mickey. GG is far quieter and less insane than Chef Mickey’s, and when you have special needs children, that’s a major plus. Kelly, that’s an excellent point! Thanks for sharing! We went the 2nd week of January, and it was BY FAR the worst waste of a table service credit of our trip! One cast iron skillet of dry turkey & dressing, another portion of dry roast beef & mashed potatoes. 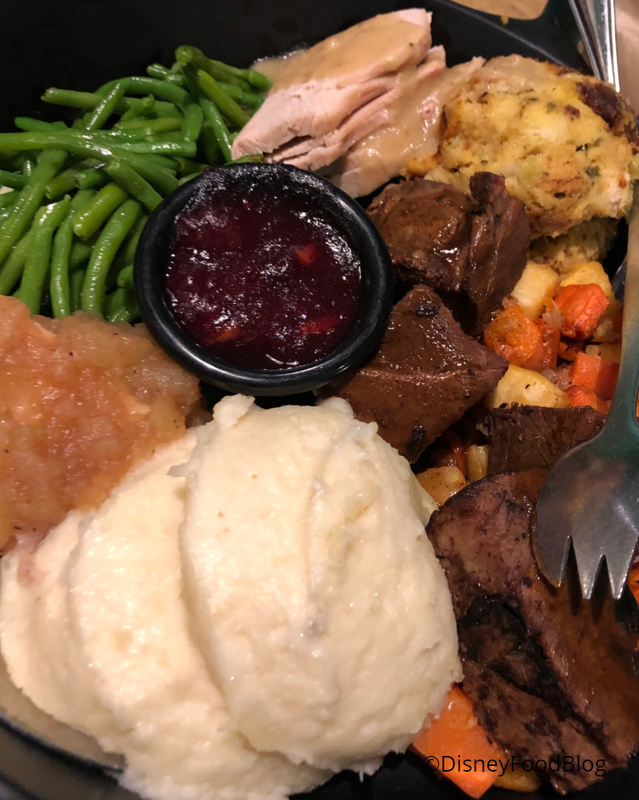 No gravy, butter or even salt & pepper in sight, add to that the annoying sound of the barking dog from living with the land for a good half of the meal. Don’t waste your time, money or meal credit on this HORRIBLE dining. We got popcorn afterwards because we were still hungry!